UPDATE: My item got reported by a Dallas-area newspaper. See Heimlich maneuver on unconscious persons causes controversy by Nick Kammerer, Rambler Newspapers, November 24, 2014 . ...The College continually monitors trends in the health care environment and analyzes issues affecting emergency physicians and their patients. 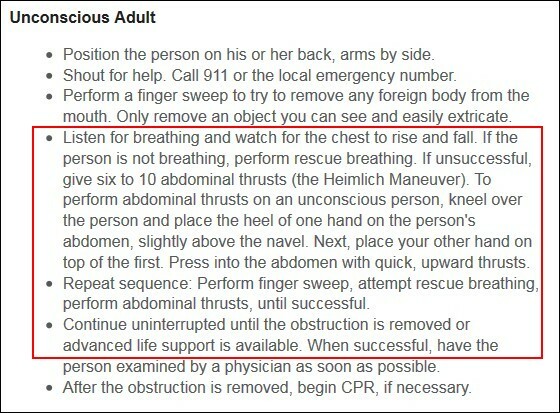 So why does ACEP recommend a choking rescue treatment that is not recommended by the American Heart Association, the American Red Cross, or the International Liaison Committee on Resuscitation (ILCOR)? Performing the Heimlich maneuver on unconscious choking victims. My layman's understanding is that the Heimlich maneuver (aka abdominal thrust) creates an artificial cough so that a choking victim may cough out a solid foreign body stuck in their throat. But if you're unconscious, you can't cough, right? Also, and I may have missed something, to my knowledge there is no published research that supports the treatment. But I have no medical training and I'm just an amateur researcher. If a prominent emergency medicine organization like ACEP recommends a medical treatment, presumably they have their reasons. 1) Approximately when did ACEP begin recommending abdominal thrusts (the Heimlich maneuver) as an effective treatment for unconscious choking victims? 2) Please explain the basis for that treatment recommendation, including citations to relevant published research. I've gotten multiple confirmations of receipt, but not even a courtesy reply.